Next Thursday, 12 December will mark the end of an era at Medland Dental Centre. Bev Lee who has cared for Medland patients for the last 24 years will be commencing her well earned retirement. 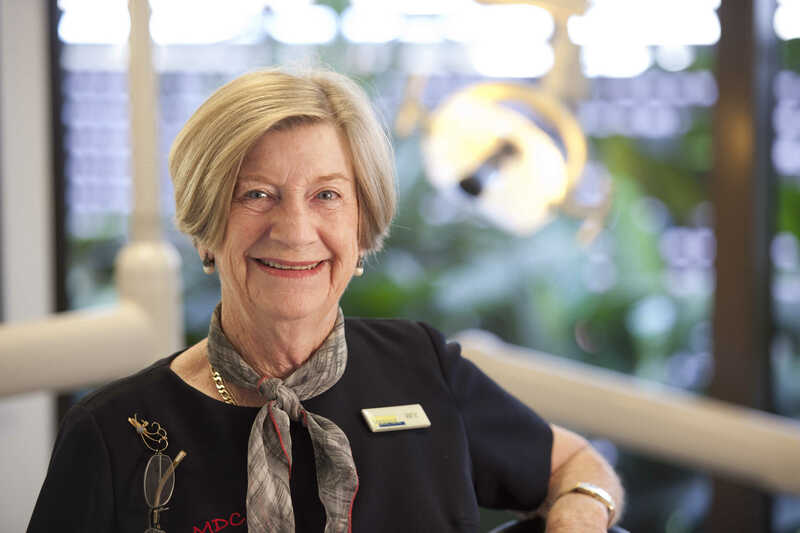 Bev started at Medland Dental Centre in 1990. At the age of 50 and with a then grown up family, Bev commenced at our front desk as a receptionist. Having a background in dental assisting, she also helped out in the surgeries from time to time as a dental assistant. In 1990, Medland Dental Centre was considerably smaller than it is now. We were still in our building at the corner of Lambton and Dudley Streets however, the building has been extended and remodelled a number of times since then. There were five dentists – Dr Tony Medland, Dr Rod Ramsay, Dr Martin Darch, Dr Brendan Guthrie and Dr Michael Howard – with a total staff under 20. Charts and appointment books were all produced on paper only. It was a different era of dentistry overall. It was not long before Dr Medland realised that Bev showed unique skills in caring for patients and created a dedicated position for her of "patient care". Bev has been as much a part of the Medland Experience as the visit to the dentist. She has become an institution. She has watched families and children grow and then bring their own children to the practice. In turn our patients have watched Bev's own children get married and have children of their own. Bev has always had a way of getting to know our patients and has a special gift in being able to put anyone at ease prior to their appointment. Her dry sense of humour is legendary! She has always been a friendly face and had a warm pair of "grandma hands" for our anxious patients. Growing up and living in the local community, Bev not only knows the local area but the people it in. She is very much a part of the local community as she zips around in the Medland Courtesy Car. We wish Bev, and her husband, Alan, all the best in their retirement. Check out our facebook page for photos of Bev's time at Medland Dental Centre, the uniforms and even the very first Medland Dental Centre Courtesy Car!